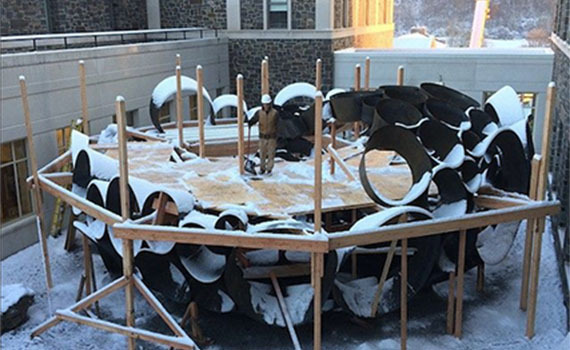 A confluence of art, engineering, and mathematics led to the creation of Colgate Professor DeWitt Godfrey’s latest sculpture, Odin, a giant steel structure now nestled in the courtyard between Olin Hall and the Robert H.N. Ho Science Center. The sculpture shares a name with the ruler of Norse gods for a reason. Godfrey’s Odin weighs in at 13 tons, was cut from 38,000 pounds of steel, is 40-feet in diameter, and is composed of 240 unique conic sections, called frustums, held together at 2,500 individual points. “Odin was really born of a collaboration between the sciences and the arts. In some ways, this is a very long and elaborate experiment to test a set of ideas,” Godfrey said, explaining how the piece evolved from a collaboration with a London engineer, a former Colgate professor, and a mathematician in Slovenia, who were all interested in exploring how the intersection of computational design, mathematics, and art could generate complex forms, patterns, and structural systems. The three-year work that culminated in the sculpture was supported by a grant from Colgate’s Picker Interdisciplinary Science Institute. Godfrey worked with Colgate mathematics professor emeritus Tom Tucker, engineer Daniel Bosia, and University of Ljubljana professor Tomaz Pisanski to draft the grant proposal and then to experiment in architectural design programs to come up with what would eventually become Odin. “Godfrey, Tucker and their international collaborators have provided a wonderful example of how the interplay between mathematics, design engineering, and art can lead to spectacular outcomes like the Odin sculpture. I consider this one of the most exciting projects that has been supported by the Picker Interdisciplinary Science Institute,” said former institute director Damhnait McHugh. 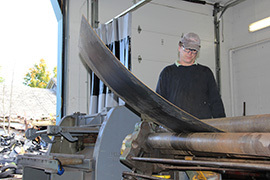 Professor DeWitt Godfrey works to roll a piece of steel into shape at Colgate’s Paul J. Schupf Studio. 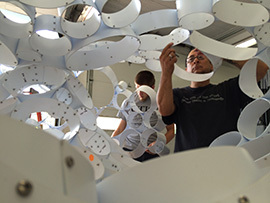 As an early proof of concept, DeWitt had his assistants connect empty Chobani yogurt cups together, as they are also frustums, to see how it would structurally behave. During the past two years, with the help of Bosia, Tucker, and Pisanski, Godfrey worked to create a series of digital models, testing various patterns and forms, which eventually led to a first formal model, about one-sixth the size of the final piece. With the physical model completed, Godfrey was confident to move forward with the full-scale piece, with each section cut, numbered, and drilled for fastening with a computer numerically controlled laser. An early model of Odin cut from styrene was about one-sixth the size of the final work. During the past few months Godfrey worked with a number of local artists, students, and alumni to roll each unique section into a conical shape for final assembly. Participants in the preparation and installation of Odin include Chase Jackson ’13, Duane Martinez, studio safety technician, Todd Thomsen, a local architect and builder, Cole Hodges, Peter Leone, Emily Fritze, and Tina Dilman.